Form Description: Performance evaluations can be a fairly hectic, and stress filled situation for any employer or Human Resource Manager. Take away some of the stress with the help of this Administrative Performance Evaluation. While it is geared to be as simple as possible to use, this form is also designed to allow you to leave fairly detailed notes as to the performance of each of your employee's. Definitely a huge help when looking at the evaluations from an administrative point of view. 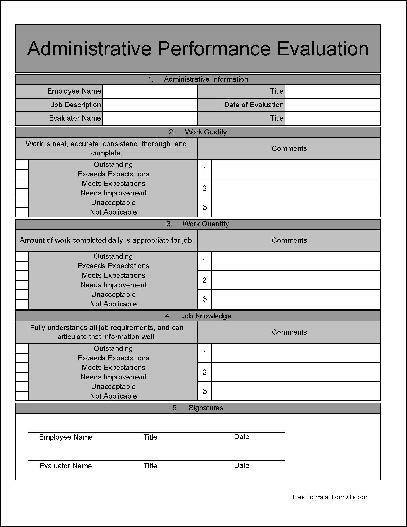 This particular edition of the evaluation form has been created with extra wide rows. This will make it a whole lot easier to fill out the form by hand, which makes it the perfect working copy to use while performing the evaluation. Furthermore, this particular edition of the evaluation form has been created with numbered sections. There are also some numbered rows in the comments subsection of each category. All of this will allow you an easier time of referencing the information that you have put onto the form if there is any question later on. You can download a PDF version of the "Basic Wide Numbered Section and Rows Administrative Performance Evaluation" form absolutely free. You can also, for a small payment, download a fully editable version of the form that you can customize as you desire. (Don't know which format to choose? Here's how to make your choice.) What would you like to do? Formville's free "Basic Wide Numbered Section and Rows Administrative Performance Evaluation" form is associated with the following keywords: employment, human resources, performance, simple, evaluation, administration, wide rows, numbered section, numbered row.